The Marmara region located at the western extension of the North Anatolian Fault Zone (NAFZ) is one of the most tectonically active zones in Turkey. Numerous catastrophic events such as earthquakes or earthquake/landslide-induced tsunamis have occurred in the Marmara Sea basin. According to studies on the past tsunami records, the Marmara coasts have been hit by 35 different tsunami events in the last 2000 years. The recent occurrences of catastrophic tsunamis in the world’s oceans have also raised awareness about tsunamis that might take place around the Marmara coasts. Aytore et al. 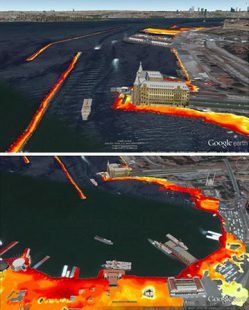 (2016) carried out high-resolution simulations in the Marmara Sea by focusing on Haydarpaşa Port of the megacity Istanbul.